About a love that will never end. We beat the odds and win the fight. Watching each other’s back, day and night. Dropping my books and losing my shoe. I saw you belonged to the streetwise guys. I expected you to make fun of me. Instead, you carried my books – born was “Me and Thee”. Those were the days when my marriage went wrong. When Vanessa was arguing all day long. My parents were on her side, making me feel low. Instead, you stayed – and said, “Me and Thee”. About pizza and root beer and other delights. Instead, you smiled – and said, “Me and thee”. You told me she was the girl you wanted to marry. A bullet in her head stopped that wonderful dream. When she died, I knew we were no longer a team. I expected you to walk on without me. Pretending someone had stolen Dobey’s gun. He ran and hollered, on the edge of a breakdown. The gun appeared under his chair – and made him frown. I expected you to put the blame on me. Those were the days when your life was at stake. To see you lifeless was more I could take. The doctors had no hope that you would survive. I fled the situation, not believing in life. I expected you to abandon me. 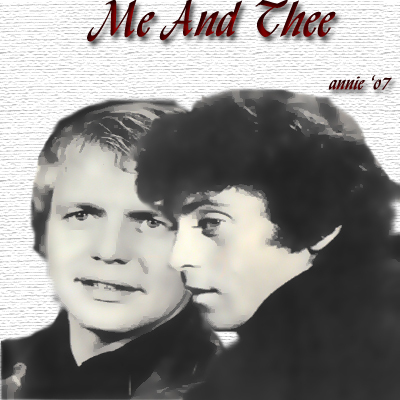 Instead, you came back – it was still “Me and Thee”. And I know there’s nothing that can tear us apart. From time to time, you suffer pain. When I can hold you, it keeps me sane. I expect you to be moody with me. Instead, you assure me, “Me and thee”.